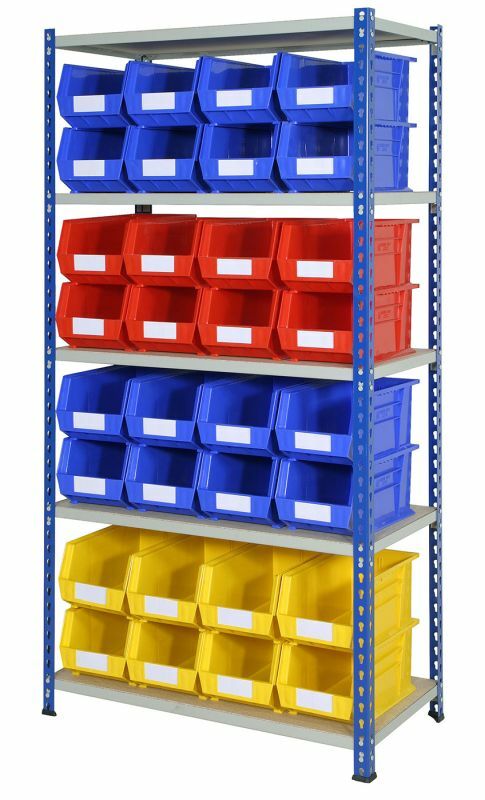 A great value small parts storage system, this shelving kit is supplied with 32 Rhino Tuff parts storage bins. The strong and sturdy shelving has a low beam profile allowing increased storage capacity whilst maintaining excellent strength. Easy to erect, the bays simply tap together with a rubber mallet saving time and effort when compared to more traditional bolt systems. 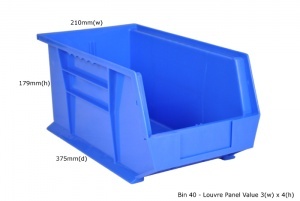 The market-leading Rhino Tuff Bin range comprises of nine different sizes. 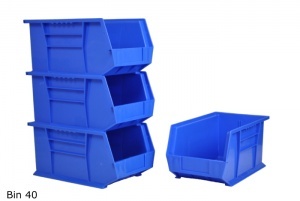 Manufactured from impact-resistant polypropylene copolymer plastic, these tough, open-fronted storage bins are shock-proof, impermeable to moisture and resistant to a wide range of chemicals, solvents and oils making them the perfect choice for garage, workshop, warehouse and industrial uses. This kit contains 1 x Shelving Bay (1830mmh x 915mmw x 457mmd) and 32 x Rhino Tuff Bin40 (179mmh x 210mmw x 375mmd) parts bins with labels. 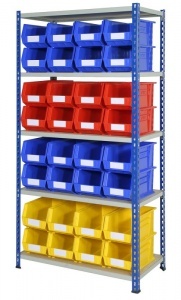 The kits can be supplied with either blue, red or yellow parts bins or with the colour combination shown in the image. If you require a different bin colour combination please don’t hesitate to contact us.